The Sharks have a traditional tackle football program that begins in August of each year and runs no later than the middle of November. Our football league is a Heads Up Football® League and member of the Fairfax County Youth Football League which is one of the largest and most respected football leagues in the Unites States. Our league strives to teach the skills that children need to play football safely and they will also need to play football safely as they advance through youth league and high school. Sharks tackle football is open to boys and girls that are between the ages of 7 and 16. The playing age requirement for participants that are between the ages of 7 and 14 will be their age on October 1st of the current season year. For participants that are ages 15 and 16, their eligibility will be determined by their age on December 31st of the current season year. Weight Guidelines – Playing Age and Weight Matrix. The Manassas Youth Football League (MYFL) and the Fairfax County Youth Football League (FCYFL) use an age and weight matrix to place kids in weight divisions. All participants will be placed in a weight division using their playing age and weight when they pick up their equipment. The MYFL does not encourage or endorse a child losing weigh to play in a particular division. A decision to lose weight will be that of the parents and no league official or coach. If a player is within 5 pounds of the maximum weight for any of the divisions he or she qualifies for, the participant will be placed in that division. If a child is between 5 and 8 pounds over the weight limit, the parent can make a decision to have the child lose the weight. If a child is over 8 pounds, they will automatically moved to the division where the matrix placed them. The only exceptions to this rule is if the participant is the youngest age at 80, 90, and 100 pounds and cannot move to the next division and 16 year olds at 155. These players will be permitted to try to lose weight to play, if the weight loss is feasible and safe range. ARE THERE DIFFERENT SKILL LEVEL TEAMS IN EACH DIVISION? With all divisions except, Anklebiter, 130 pound, and 155 pound, there are three competitive levels. National, Central, and American. However, these levels are also determined on how many teams an individual team placed in a single weight division. American Division – This division is for the oldest and/or the most experienced kids in the weight division. National Division – This division is for the youngest and least experienced players in the weight division. Central Division – This division is a mix of athletic experience. Will my child be evaluated for team placement? Yes, in all weight groups, with more than one team, the first week of practice will be an evaluation period. During this evaluation, participants will be rated by their ability and ranked for a division team draft. DOES THE MYFL HAVE A PARTICIPATION RULE? All divisions, except for American level teams, have a player participation rule. Due to that rule, all Anklebiter, Central, and National level teams will have no more than 22 players. Each player must have a starting position in those divisions. We do try to keep team sizes around 16-18 players if possible. WHERE DOES THE MYFL PRACTICE? The tackle season begins summer practices at the beginning of August and teams are permitted to practice every weekday evening until school begins in Prince William County. Once school begins, coaches are only permitted to practice 3 times per week. All practices will be held at Mayhew Park and Stonewall Jackson Middle School. Once school begins, all teams will move back to Mayhew Park for the remainder of the season. WHAT DO I NEED TO PURCHASE FOR TACKLE FOOTBALL? Game jersey, pants, and socks. Athletic cleats at do not have metal cleats. As part of final team placement, each child is required to participate in one of the official FCYFL weigh ins that take place on Saturdays during the first three weeks of the practice season at Falls Church High School. 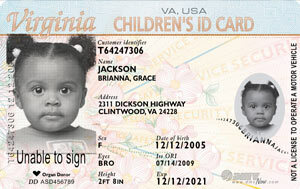 Each child will need a current DMV ID to prove identity, age, and residency. No other form of identification will be accepted. You will receive your new ID card in the mail. Customers will receive newly designed secure cards by mail. Customers renewing Virginia ID cards can keep your ID card to carry with a receipt, until you receive your new ID card in the mail.DMV has converted to a new secure process for issuing driver's licenses and ID cards and has discontinued issuing them over the counter. The new secure process is similar to the U. S. passport process and reduces the risks of fraud. Make sure DMV has your current, correct address on record. If you have moved, notify DMV right away. Your license will be mailed to the address in DMV records. The U.S. Postal Service will not forward driver's licenses. WHERE DOES THE MYFL PLAY GAMES? The MYFL participates with teams from Prince William, Fairfax, Loudoun, and Arlington Counties and therefore games will be played at fields in all those counties. MYFL Tackle Football home fields are Gainesville Middle School, which is a turf field and Mayhew Fields. Games are normally played on Saturdays, but can also be played on Friday evenings and Sundays. All Games are officiated by professional officiating organizations. WHAT IS THE MYFL'S REFUND POLICY?